Columbia's history is rife with revolution. From the Spanish conquests of the 16th century to the 19th and 20th century peasant uprisings, the land has seen much spilt blood and little stability. In the modern era, the Drug War ups the ante even more, with drug lords, leftists guerillas, right-wing paramilitaries, and U.S. special ops troops and mercenaries all fighting one another for what they perceive as theirs, whether it be money, political power or protection of oil pipelines. The little guy, as always, is caught in the middle, trapped between warring idiologies. Columbia: d20 takes you into this real-world locale, explaining the country's tumultuous history, geography, and power players. This sourcebook, another in HDI's Real-Life Rolplaying series, immerses you in the turmoil, forcing you to confront two political extremes and whole lot of corruption in between. Nobody can enter this tangle of vendettas and greed without coming away with a deeper understanding of what drives Colombians to do the things they do, whether it be to fight for a better life, to go for the money or to just survive against all odds with dignity intact. * A summary of Colombian history, including present conditions. 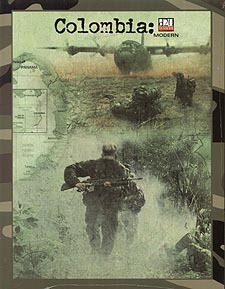 * Information on guerilla movements in Latin America and how to roleplay them. * New advanced character classes: the combat journalist, the guerilla fighter, the hitman, the political zealot, and the treasure hunter. * New rules, feats and weapons. * A complete sample setting, the town of Medilaca. * Two adventures, ready to play, thrusting characters into the underworld of kidnapping and the Drug War. * A strategic campaign, displaying all sides of the conflicts plaguing Colombuia and giving characters a chance to solve these problems. * Suggested alternative world campaigns.